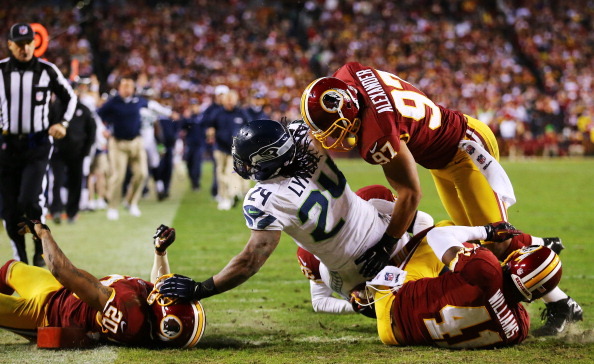 « Video: ESPN – Who Wins Seahawks at Redskins? It looked for awhile Sunday like it would be Russell Wilson and the Seahawks whose playoff ride would be ending in RFK. Instead, playing behind a solid defensive effort and the offense or Wilson and RB Marshawn Lynch, the Seahawks won their first road playoff game since 1983, topping Robert Griffin III and the Redskins 24-14. The Redskins led 14-0 in the first quarter, and appeared to be rolling, but the Seahawks suddenly got a turnover, and then turned up the heat on offense, and once they took the lead on a Lynch TD run, it was apparent they would be heading to round two. The Seahawks will play in Atlanta Sunday against the first seeded Falcons. Seattle has now won six in a row. Lynch’s 27-yard touchdown run with 7:08 remaining and a 2-point conversion to TE Zach Miller gave the Seahawks a 21-14 lead, and the play that essentially put the outcome to rest came shortly afterward. 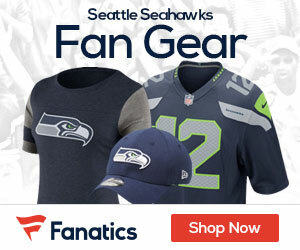 The Seahawks got very hot towards the end of the season. There defense has proven themselves throughout the season. This game they have in front of them away in Atlanta have no chance of winning. With a rookie QB and a banged up RB I don’t see them making it a game. With the almost undefeated Falcons looking for a Super bowl ring nothing stands in their way. Matt Ryan and the stacked WRs along with the dominate duo RBs there amazing.